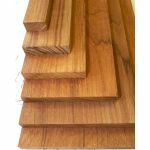 Buck Woodcraft offers a nice selection of genuine FEQ (First European Quality) Asian teak marine lumber in a range of sizes and prices. Milled Marine Teak Lumber --To simplify things a bit, we now offer teak boards in several standard sizes. Unless otherwise specified, these dimensional boards have been machine-surfaced on all four sides (S4S) -- and all listed dimensions are accurate within a 1/16” tolerance. 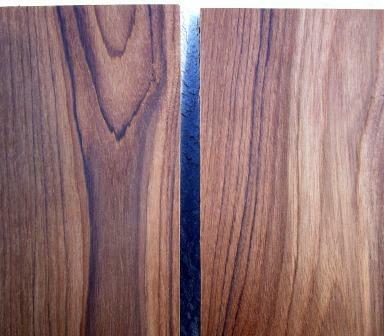 If you’d like to try before you buy large or multiple boards, we now offer representative samples of the teak we sell. We mill all our finished teak here in our shop using only First European Quality wood. If you need wider and/or longer 4/4 (nominal 1" thick) or 8/4 (nominal 2" thick) milled teak boards than those shown in our product listings, or ½” thick teak boards longer than 5’, please call us with your requirements at 305-743-4090 or email us. What’s the difference when buying milled dimensional teak & rough-sawn lumber? Our milled Asian teak lumber is planed to specific thicknesses and cut to specific widths & lengths. So if you order a piece of lumber specified as ½” thick x 4” wide x 5’ long – that’s very close to (and in most cases, exactly) what you’ll get. Milled lumber that’s thicker than ½” will vary between 7/8” - 15/16” for 4/4 stock, and 1-7/8” - 1-15/16” for 8/4 stock -- but we try to make certain that the thickness you get will be consistent across multiple boards shipped in the same order. Our rough-sawn lumber is sold by the board-foot, and not by any particular dimension other than thickness. (One “board foot” measures 1” thick x 12” x 12”. The rough-sawn boards you buy will be random widths and lengths, and will generally be lightly planed on two sides and have rough-sawn edges. 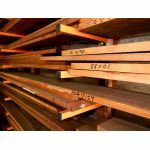 If you know the dimensions you want to end up with and have the shop tools to mill your own wood to its finished sizes, buying rough-sawn lumber can save you a fair bit of money versus buying dimensional boards. The main condition is that you must buy entire boards from what we have in stock -- not just partial lengths. As to how many board feet are in the boards you buy, we have an online board-foot calculator that makes it easy for you to estimate your approximate material costs in advance. Need A Custom Price Quote? If you need a price quote for rough-sawn, large-quantity or custom-milled teak lumber, we'll be happy to provide one. Click here to complete and submit our on-line price quote form.